Ireland, so small but so charming. There are many attractions, places to visit, as there are many possibilities for recreation and fun, enriched by new experiences. To discover the charm of this island is to leave from Dublin and from major cities to plunge into a series of panoramas, landscapes and small towns as features and villages that show you back to years and years ago. 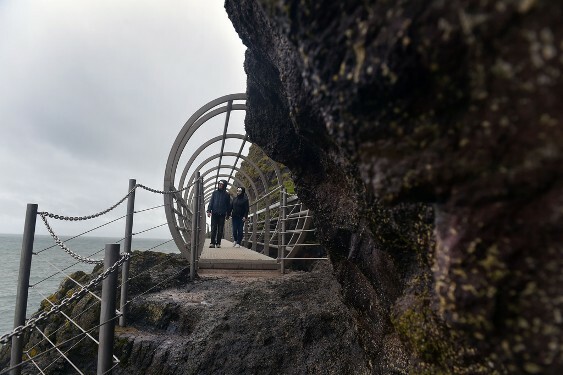 For thrill seekers, an event not to be missed is The Gobbins footpath, a magnificent journey of about 3 km on the cliffs overlooking the beautiful Causeway Coastal Route. After years of maintenance work and after an unexpected period of closure due to bad weather this winter, the trail will again be viable as of this summer. The Gobbins Path runs along the cliff along a stretch of sea; of Edwardian origins, this path has the same, lovely original architectural features dating back some 100 years ago. An unmissable and fascinating guided coastal route, unique in Europe. The restored path, presents a series of suspension bridges and tubes, a grand staircase, caves and tunnels dug into the rock and offers an adventure to thrill, to those who want to dare. The trail is located a few kilometers from the city of Belfast – just over 32km – and consists in this path with some strategic points, which offer breathtaking views as “The Aquarium”, the tubular bridge on the Wise’s Eye, which takes its name from the man who designed the trail, designed to provide access to the most spectacular part of the original route, which runs through the raging waves to reach underwater caves and cliffs.